"The desire to radically extend our lifespan is probably as old as humanity itself, yet not much progress has been made toward this goal. At the time of writing, a French woman, Jeanne Calment, still holds the record for the longest human life at 122 years ( 1875-1997). Medical science hasn't yet been able to do much about the maximum lifespan, since we have good evidence that there have been a handful of people throughout history who have lived longer than a hundred years. However, it has done much to help the average age of humans, mostly by reducing infant mortality. "Radical life extension is the idea of using science and technology to push beyond this biological wall of just over a hundred years to allow humans, or post-humans, to live hundreds, if not thousands, of years. One way this might be achieved is to use the same strategy my neighbor uses to keep his old truck going: Simply replace worn parts. So, while the average car lasts about eight years or so, my neighbor has an immaculate truck five times that age. In theory, it will be possible to keep a human body going indefinitely so long as we repair and replace ageing cells and organs, perhaps by using advanced stem cell technology. Using a patient's own stem cells, scientists have already demonstrated that it is possible to grow new organs, like bladders, on a lab bench. The idea is to 'cut and paste,' for example removing an old bladder and replacing it with an organ grown in a lab. 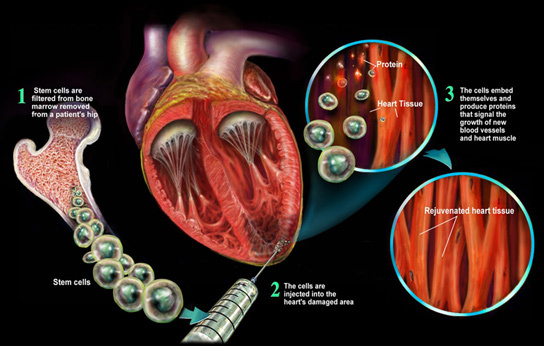 And it may not be necessary even to do this; in clinical trials, stem cells have been used to repair damage to heart muscles suffered during a heart attack. "Part of the difficulty in reversing ageing and death is that there are numerous causes involved. The SENS foundation, a nonprofit orga­nization devoted to advancing radical life extension, has identified seven causes of ageing (cellular atrophy, cancerous cells, mitochon­drial mutations, death-resistant cells, extracellular matrix stiffening, extracellular aggregates, and intercellular aggregates). Each cause will require its own biomedical or engineering solution. Still, the fact that we are making progress, as demonstrated by some remark­able techniques to extend the lives of animals, suggests that science and technology will allow us to radically extend our own lifespans. Recently, scientists were able to extend the lifespan of mice by 25 percent simply by developing a cellular 'kill switch' that removes a certain class of old cells (senescent cells). Not only are the mice living longer, they are also healthier, with fewer age-related diseases. "None of the technologies described so far will help in the case of catastrophic injury; all the stem cell technology in the world won't help you when a piano falls three stories and lands on your head. But transhumanists have envisioned technological fixes for even these contingencies, which -- though futuristic -- might well be possible within the twenty-first century. The idea is, in effect, to create a backup: a possibility would be scanning and recording your brain down to the micro-level and then reconstructing a new brain from the data. One version of this proposal envisions a small army of nanobots -- molecular size robots -- recording the molecular structure of your brain. In the event of traumatic injury, the nanobots could be activated to repair a brain crushed by a piano or to create a new brain based on the saved blueprint. "Another possibility is to upload this information about your brain to a computer platform. In effect, this would be like moving your mind from biological 'wetware' (your brain) to computer hard­ware. This raises a number of thorny metaphysical questions about whether it is really 'you' who survives this migration, or whether this is simply an exercise in making a copy of you. Transhumanists (and philosophers) are deeply divided on this question. I side with those who say that we can survive such migration. Indeed, I go so far as to argue that there could be multiple versions of one's self; if you survive the transfer from a biological platform to a computer platform, then there is no principled reason why you could not be uploaded to multiple computers. In this way, immortality, or at least something very close to it, might be achieved."